The origination of netball began in England in the 1890s when the game was derived from an early version of basketball. A set of standard rules for international play was devised by the 1960s and the International Federation of Netball Associations now has over 60 teams playing in five regions around the world. The object of netball is to score more points than your opponent. A netball game lasts for a regulation 60 minutes. This is split into four quarters, with each quarter lasting 15 minutes. Between the first and second quarter, and the third and fourth quarter, there is an interval of three minutes. Between the second and third quarter -half-time - there is an interval of five minutes. A referee or umpire is allowed to call time and when they do, the time keeper will stop the timer, which begins again when play starts again. There is a maximum of two minutes allowed for an injury. The standard netball games features 7 players on each side although games can go ahead with a team having a minimum of 5 players. There are set positions in a netball team and these positions will limit where the player can be on the court. The netball court, which is just bigger than a basketball court, traditionally measures up at 30.5 metres (or 100ft) long and 15.25 metres (50 ft) wide. The netball court is divided into three sections and this impacts on where players are allowed to move. The sections are referred to as the two goal thirds and the centre or middle-third. A netball game can be played with a court, two goals and a ball. Regulation uniforms are part of the game in official matches but impromptu netball games can take place with a minimum amount of equipment. A goal is scored in netball when the ball is passed to a player in the goal third who shoots the ball through their opponent’s goal ring. Only the Goal Shooter or Goal Attack can score goals in netball and they must be within the semi-circle when they shoot. To win in netball you must score more points than your opponent. 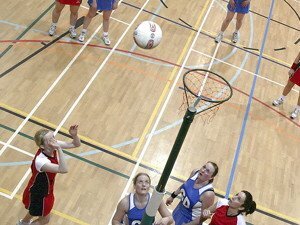 The netball ball must be moved around the court by passing and there are a number of different passes available to a player. The ball must be worked to the Goal Shooter and Goal Attack players, who attempt to shoot from inside the semi-circle. A match consists of four quarters lasting 15 minutes each. Each team can have a maximum of 7 players and a minimum of 5. The court must be divided unto 3 sections, with each player holding a specific position on the court. If a player moves into a position that they shouldn’t be in, they will be deemed to be offside. Players cannot hold the ball for more than three seconds. Players cannot take more than 1.5 steps when in possession of the ball. The ball must go through the ringed hoop for a goal to be given.